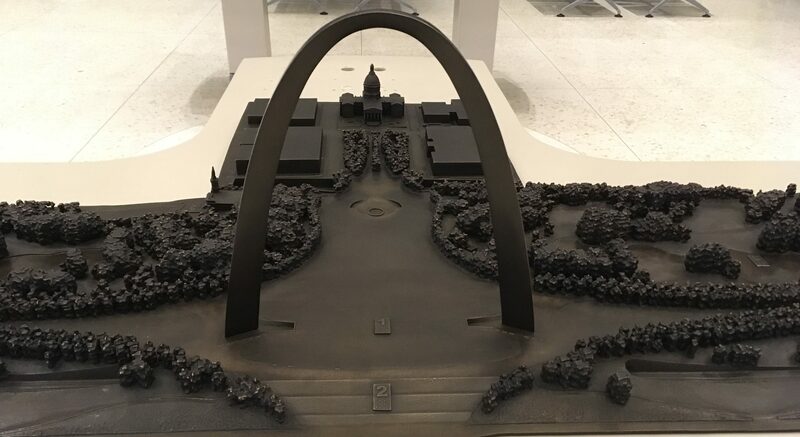 They called it the “Gateway to the West”, and now more than 50 years after its completion, the 630′ tall Gateway Arch in St. Louis, Missouri is surely one of the most recognizable attractions to be found in the prairie region of America’s heartland! 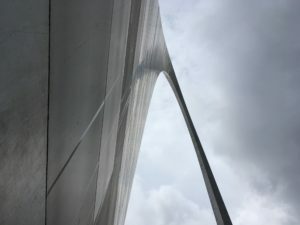 I visited the Arch one rainy afternoon recently, and was amazed at its simplistic beauty and elegance. 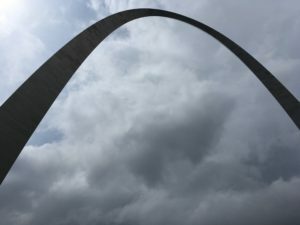 Remembering a visit to the Arch 30 years ago, I stood with my back to one of its feet and marveled at the angular twist the Arch makes as it spans 630′ (the same as its height) from the outside of one base to the other. Call Nate at 314-285-8530 if you’re looking for a comfortable ride anywhere in St. Louis! 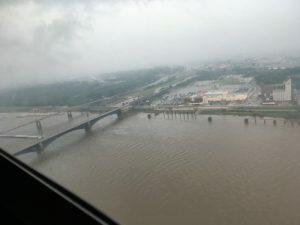 Nate, my taxi driver, dropped me off at the base of the Grand Staircase on Leonor Sullivan Blvd., and I made my way up to the Arch with the Mississippi River and the pleasure boats just over my shoulder. Once you’ve reached the top, to the left will be the south base of the Arch, and a subterranean entryway down into the visitor center. 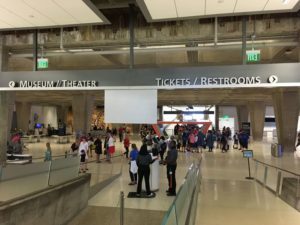 Be advised, when you enter the visitor center, you’ll first have to pass through a metal detector and have your bags scanned just like in an airport. These are the days we live in, even out on the prairie! 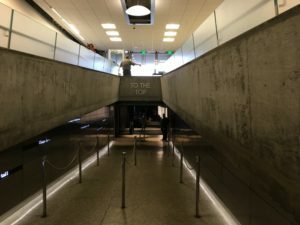 Once below, I found a surprisingly large area which includes the huge gift shop, the Odyssey and Tucker Theaters, and the Westward Expansion Museum. Sadly, on the day I was there, the museum and theaters were closed for renovation, but I was still able to find a few souvenirs in the shop, as well as make my way to the top of the Arch. Now, to visit the top you’ll first have to purchase a ticket. I bought mine online earlier that day here. 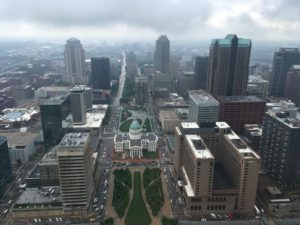 I paid $13 for my tram ticket to the top, but there’s a discount if you have an America The Beautiful pass.You can also get them in the visitor center, or at the Historic Old Courthouse across the street to the east of the Arch. After showing my ticket, I was sent down a hallway to a loading area. Along the way there’s a green screen backdrop and a lady who’ll take a souvenir photo of you if you like. The picture is fun, but be prepared to pay almost $30 for it. The “tram” to the top is a series of small compartments which always remind me of climbing into a clothes dryer. 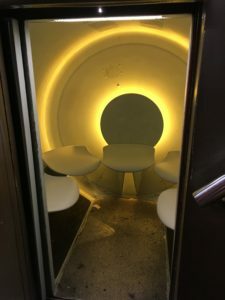 Each compartment seats about five people, and although it’s a tight fit, the ride to the top is slow and comfortable. 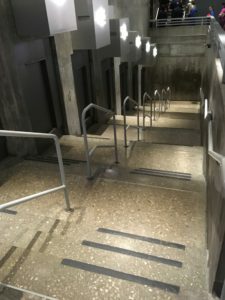 The door to your compartment has windows which allow you to see the passing stairways as you go, otherwise you might wonder if you’re moving at all! Once at the top, you’ll climb the stairs to where there’s a walkway which has windows lining both sides. 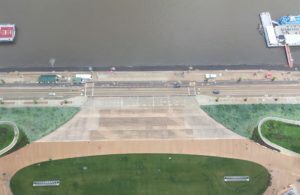 These windows face the Mississippi River on the West, and St. Louis on the East. On the day I was in the Arch, it was a little windy, which meant that one could sense a slight shifting of the floor. According to the brochures, the Arch can actually sway 18″ on a windy day, so that shifting feeling is no phantom! Whether you’re a solo traveler like myself or visiting the region with others, the Gateway Arch in St. Louis really is a must-see. 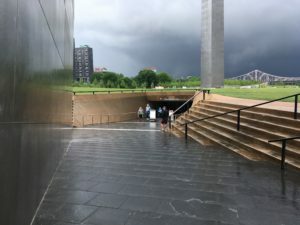 If you go, be sure to get your tickets ahead of time (they’re time-specific), and be sure to take in not only the Arch, but the beautiful park around it, including the Jefferson National Expansion Memorial, which encompasses the Luther Ely Smith Square and the Historic Old Courthouse and Old Cathedral. There are plenty of spots to buy a hot dog or a post card, and there’s also parking just to the north of the Arch. 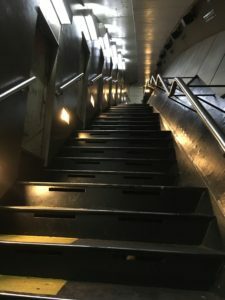 I would not recommend the Metro, however. It doesn’t have a very safe reputation, according to many locals I spoke with. Now boarding Prairie, Party of One to the top! ← Travel Tip: The Best Way To See Lake Ozark From The Air! Be aware, those suffering claustrophobia may not much enjoy the rides up and down, but the ride WILL END and the door WILL OPEN. It really is worth the trip. Have fun!! Thanks, for this article and pictures! It made me feel like I’d traveled home for a bit, if only in my mind. It has been close to 20 years since I’ve seen Missouri or the Arch. 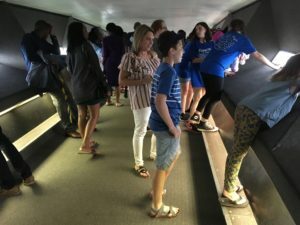 Your pictures and story brought back a lot of precious and bittersweet memories of taking my children to the top of the Arch. There use to be a telephone hanging on the wall opposite where you walked into the top of the Arch. If the wind was blowing the cord would be swaying back and fourth. I wonder if anyone else ever noticed it? 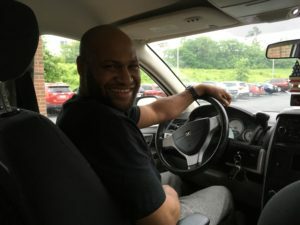 This travel blog made me a little homesick but, the memories it brought to my mind were priceless! It made me realize no matter how far you travel or where life takes you, there’s no place like home! Thanks, Prairie Man! !